After Stanford got embarrassed in Seattle in front of a national audience on a late-September Friday night, I took a lengthy walk around the Durham Bulls baseball stadium. 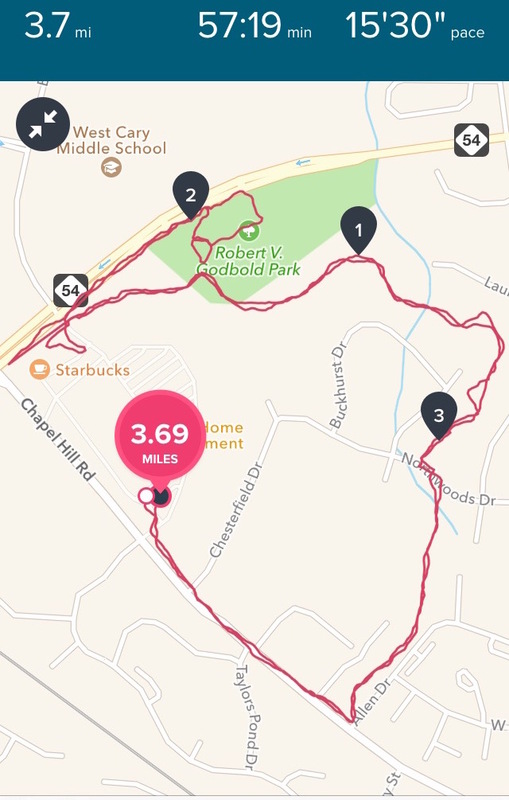 This past Saturday, prior to the Stanford football team’s encounter with Notre Dame, I took an even longer walk, wandering about a residential part of Cary, N.C. As this screen capture from my smartphone’s Fitbit app shows, I covered 3.7 miles in a shade less than an hour. As you know, Stanford came away with a thrilling 17-10 road win on Saturday. So maybe I need to take a hike before every Cardinal football team for the rest of this season…? Cheeps and Chirps — belated July 2016 Democratic National Convention edition! Yep — have some more Twitter! Hipster doctor: <Sniffs> I’m sorry, but are you SURE that this case of Zika was contracted locally? Cheeps and Chirps — belated July 2016 Republican National Convention edition! I don't like cops shooting civilians. I don't like civilians shooting cops. I don't like civilians shooting civilians. Man outside coffee shop: I’m hanging my dog here. Man: He rarely eats anybody. Me, laughing: Let’s hope I’m not the exception! Here are some more recent odds and ends from my Twitter feed. Now that's what I call a party!!! One of my goals is to develop an unhealthy relationship with health food. Because — full disclosure — a friend of mine plays a role in the new Cary Players production of Isn’t It Romantic, I went to see the revival of Wendy Wasserstein’s 1981 comedy on opening night at the Cary Arts Center. The show is quite enjoyable, mixing humor and pathos as it shows Janie and her longtime friend, Harriet, negotiating the compromises and sacrifices that they must make in their work and personal lives after moving back to New York City in their late 20s. Harriet, who as the show opens is a freshly minted Harvard M.B.A. on the verge of being hired by the Colgate company, is career-driven, much like her mother. In fact, a key question she faces is how much she wants to follow the trail blazed by her mother, Lillian, a successful business executive and single parent — which would have made her something about as unusual as a unicorn in the 1960s and ’70s. 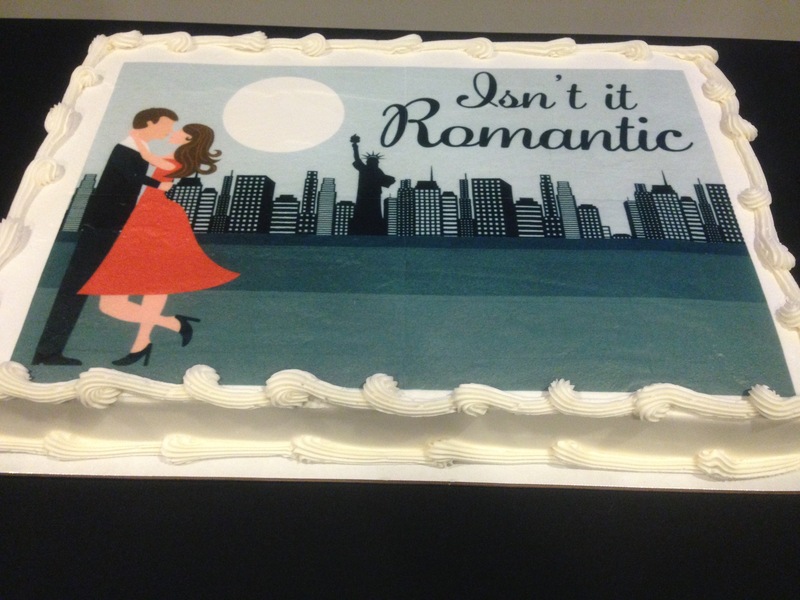 This cake was displayed in the lobby of the Cary Arts Center during the premier of the Cary Players production of “Isn’t It Romantic” by Wendy Wasserstein on Friday, Sept. 18, 2015. Janie isn’t exactly certain what she wants. For months after she moves into her downtown Manhattan apartment, she puts off unpacking. She begins a romance with Marty, a sweet doctor whose father is a schlocky restaurateur (and possible arsonist), but she drags her feet whenever he expresses interest in moving in together, getting married and starting a family.